﻿ 3d-inspection software & Design Solutions in Chennai. Geomagic Control (formerly known as Geomagic Qualify®) is the industry’s most comprehensive, robust and accurate 3D metrology solution and automation platform. Geomagic Control delivers the highest accuracy, speed and comprehensive, automated reporting on the quality of as-built parts for first-article inspection, production inspection, and supplier management using CMM and laser scanning tools. 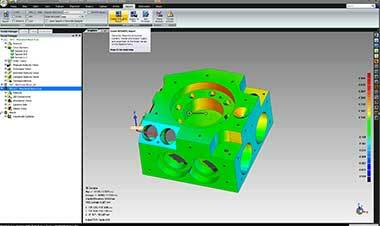 The software delivers CAD importer tools and airfoil analysis at no charge to help manufacturers rapidly increase product and manufacturing quality, identify process issues and build productivity. 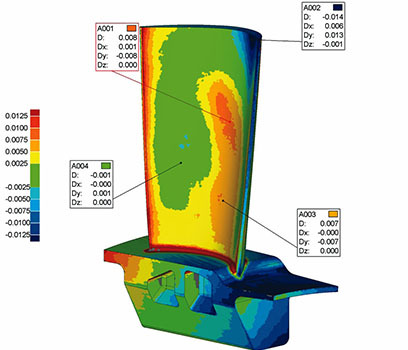 Advanced GD&T, probing and dimensional inspection functions enable fast and precise measurement of parts, and Geomagic Control includes intelligent creation of reports in 3D PDF. The Geomagic Control Automation Platform delivers the power to streamline almost every process, reduce human interaction in measurements and recording, decrease measuring time, and markedly enhance R&R results. Parts manufacturers of every type use Geomagic Control to verify the integrity of manufactured parts and to quickly identify issues that occur during manufacturing. Using non-contact scanning (offline and inline), CMMs, probes and CT scanners, measurements can be quickly taken, analyzed and reported. Mold makers and toolmakers benefit by using Geomagic Control to verify the accuracy of molds, tools and dies as they are created. Where the human eye might not detect slight blemishes, Geomagic Control can easily identify and show where errors exist, thus reducing the risks of faulty manufacturing. Aerospace manufacturers use Geomagic Control extensively to measure advanced turbine blade design specs, including twist, mean camber line, maximum thickness, lead trailing edge and trailing edge radius. With Geomagic Control’s Airfoil analysis available at no charge, customers can benefit from the unique speed and functionality of the software without additional fees and unexpected integration requirements. Whether checking new medical implants for accuracy or measuring and analyzing worn parts to improve designs, Geomagic Control plays a significant role in improving quality, especially in the area of custom medical manufacturing. Recent advances in medical CT scanning also make it feasible to check the progress of remedial surgery – like orthodontic procedures – quickly and painlessly. Geomagic Control supports all key 3D scanners in the industry. Fully integrated with 3D Systemsaffordable Geomagic Capture scanners. In addition to the industry-leading feature sets within Geomagic Control, Geomagic Control enables the direct, native import of a range of MCAD and neutral file formats at no additional charge. This allows fast and accurate comparison and reporting of first article parts or manufactured assemblies to be compared to the original design data to establish if they are within tolerances.